If you are specifying chemical holding tanks that will be outside, exposed to the elements, you have some special circumstances that need to be taken into consideration. We’re not talking about heat created when using a tank as a chemical reactor or heat generated from immersion heaters meant to keep a liquid at a specific temperature; we’re talking about heat from the sun. In order to avoid potentially hazardous conditions in your outdoor chemical tank, you need to calculate how hot the liquid and the air will get in the tank as it sits in the sun on the hottest summer day. Both metal and plastic expand and contract. To solve the potential issues associated with vibration, expansion and contraction, pipes should not hard-wired to the tank, secured tightly to the ground, or otherwise unnecessarily constrained. They need to be free to move up or down. On the other hand, you should not put continuous unsupported weight on the tank flanges (such as heavy valves). To solve this issue, use extension joints designed to isolate the tank and its flanges from the surroundings. In addition, any heavy equipment that “hangs” on the tank should be supported separately (from the ground). If you don’t make accommodations for expansion and contraction, your tank is more susceptible to cracking, which can be disastrous to your plant and your team. Unlike rotomolded tanks, Houston PolyTank’s exclusive extrusion wound tanks can be fixed in the field. In addition to heat caused by the sun, there is also ultraviolet light to contend with. There will always be some discoloration from the sun–it is a natural part of the wear and tear of the tank that needs to be expected and guarded against whenever possible. UV rays will constantly be attacking plastic tanks, and Houston PolyTank’s plastic storage tanks come with UV inhibitors blended right into the plastic and welding at the time of construction. With plastic chemical storage tanks, rain is not particularly an issue. Even acid rain will have little to no effect on Houston PolyTank’s plastic extrusion wound tanks. Accessories, however, are a different story. If an engineer specifies a metal component, like a ladder or railing, those could potentially be impacted. To avoid corrosion, some components can be made from fiberglass or plastic. No matter how short or tall your chemical holding tanks are, it’s important to make sure there is some method of grounding to mitigate against potential lightning strikes. A lightning rod or metal cable needs to run to the ground in order to keep lightning from starting a fire. This is especially true for tanks that store oil. When calculating the specifications for a chemical storage tank, engineers need to structure tank strength to withstand the stresses of wind shear. When the tank is full, this is typically less of an issue, so calculations need to be made based on an empty tank. This is not as important for a very small tank, but Houston PolyTank often creates very large tanks that can be very tall. The taller the tank, the more wind shear it will be susceptible to. Note: Houston PolyTank engineers every tank to withstand up to 120 mile per hour winds when empty. 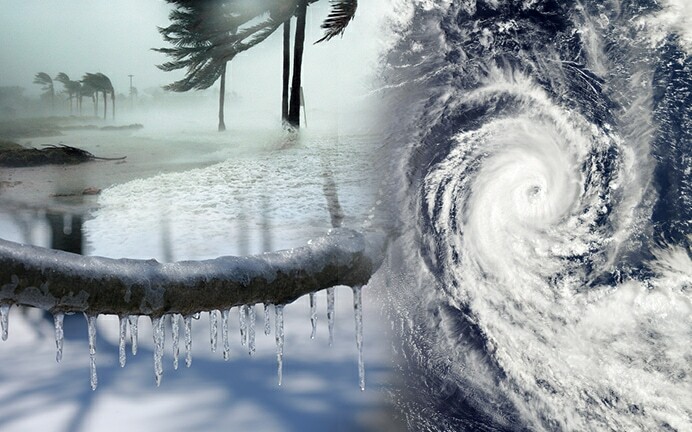 Blizzards, tornadoes, earthquakes and hurricanes can all wreak havoc on outdoor chemical storage tanks. If the tank will be housed in an area that is prone to these types of weather occurrences, discuss your needs with your tank engineer. In California, seismic supports are typically added to protect against earthquakes. In areas where large snowfall creates stress on top of the chemical holding tanks, drainage holes in cone-topped tank skirts or surface heaters can be engineered into the tank in order to mitigate against heavy snow loads. Heat, cold, wind, rain, snow, sleet—there are plenty of weather challenges to proper storage, so it’s important to think through all of these issues right from the start and specify a tank that can stand up to the best of what Mother Nature dishes out!